The Crown Mark, The Full Bee, The Stylised Bee, The Missing Bee and other Hummel Marks. The first three hummel figurines Puppy Love, Little Fiddler and Bookworm were marked FF15, FF16 and FF17. When they were first created the figurine series designation or mold numbers had not yet been set up. When Goebel reached a licensing agreement with Sister Maria and the Convent in 1935, the early figurines were then marked HUM1, HUM2 and HUM3. 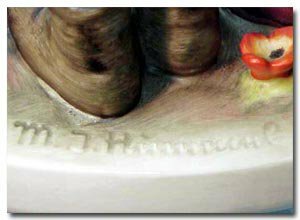 The signature of Sister M.I.Hummel is incised on the base of almost every Hummel piece. When the Convent and Sister Hummel made the historic contract with Franz Goebel, it was agreed that her signature, her personal stamp of approval, would appear on every piece. It still does so today and the only exception is if figurines are without bases or do not have any adequate surface to display the signature. The identifying marks on the UNDERSIDE of Hummels tell the Hummel Model Number (HUM), the size indicator (Arabic and Roman Numerals), the year of release (usually the year after the production year), and sometimes the paint and/or painters code numbers (incised Arabic numbers or script initials). In 1935, the “Wide Crown – WG” trademark was added. On the earliest figurines it was incised on the bottom of the base. This mark is known as the “Crown Mark”. When both of these markings are found together on one figurine, this is called the “Double Crown” mark. From 1946 thru 1948, “Made in the US Zone Germany” was added. In 1950 Goebel paid tribute to Sister Hummel and the trademark was changed to a bee flying high within a V. The name Hummel in German means bumblebee and the V stands for “Verkaufsgesellschat” or Distribution Company. This new mark was called the Full Bee and was used until 1955. The Goebel Company still produces the work of Berta Hummel today. The next changes are mind boggling and this is where collector’s get confused. In 1956 the trademark was modified to a smaller bee with it’s wing tips parallel with the top of the V.
In 1957 it changed again with the bee slightly raised above the V.
In 1958 the bee was smaller yet and it flew deep within the V.
With all of these changes to the trademark, they are all still considered to be a tmk-2. All prototypes must still have the Convent approval before being produced. Sister Maria’s love of children and art has allowed the generations to cherish and adore the pert faces of all M I Hummel figurines. This time they started printing the name Goebel with the Stylized Bee and V above the name and positioned between the letters b and e. This new mark is better known as the “Last Bee Mark” and was used until 1979. This trademark is know as “The Missing Bee” or TMK-6 and was used until 1991. This mark is of historical import as this time the change was not only symbolic of the reunification of the two Germany’s in the removal of West from the mark, but very significant in another way. The mark illustrated here is for exclusive use on Goebel products made from the paintings and drawings of M.I. Hummel. Other Goebel products will bear a different mark than that used on Hummel pieces. New collector’s sometimes confuse this mark as a tmk-1 Crown. This new trademark was used until the year 2000. Always remember that the first thing to check on Hummel figures … is the presence of the Sister Maria Innocentia Hummel signature mark as pictured above. At least then you will start on the right track.